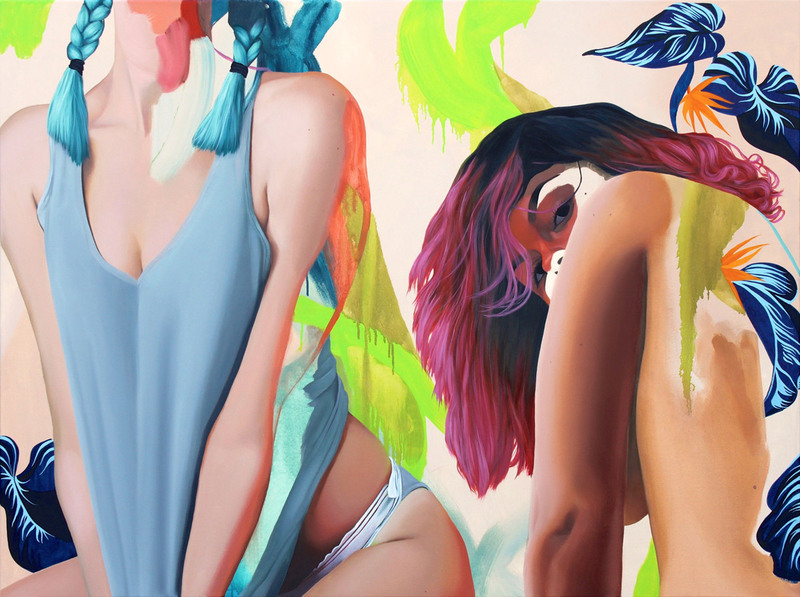 Ones to Watch is a series of interviews profiling our favourite artists on Society6. 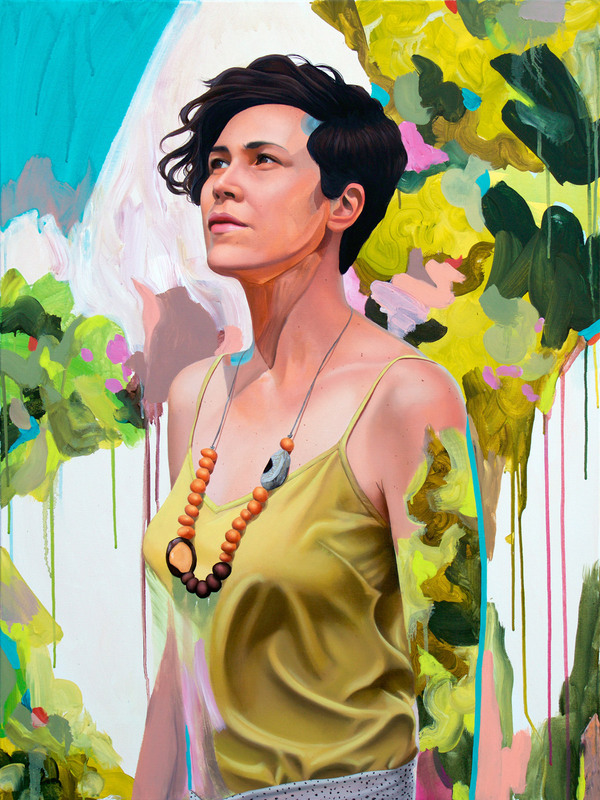 This instalment features Sydney, Australia-based artist, Kim Leutwyler. Jeff Hamada: From what I’ve read it seems you’ve lived quite a nomadic life, constantly moving around the US. Now that you’ve been in Australia for several years, does it feel like home? Does anything feel like home? Kim Leutwyler: I really enjoyed moving around every couple of years. Sometimes we would even move to a new house within the same town or city. I was constantly able to reinvent myself and meet new people. It is fascinating to hear stories from those who grew up in the same town their entire life. They try to describe this sense of home that I’m not sure I fully grasp, but I‘ve never wanted to give up my nomadic way of life and I doubt I ever will. I’ve lived in Sydney for 6 years now, 5 of which have been spent in the same house. That’s the longest I’ve lived anywhere consecutively. Naturally I have the itch to move again, so Melbourne is next on the list! Luckily I have an adventurous partner who is also keen for a change of scenery. JH: Are there other artists in your family? Is it in your blood to be one? KL: My immediate family is very artistic in their spare time, so I blame them for my interest in art! Mom often paints, Dad dabbles in ceramic sculpture and little sis does sculpture, painting, animation, printmaking, movie props and monster makeup. After graduating high school I initially enrolled in Accounting for my University degree (I know…total nerd) and then made an impulse decision to switch to Art History. My parents were extremely supportive, especially when I layered in a degree for Studio Art focusing on Ceramics and Printmaking. They always believed in me, and I will never be able to thank them enough for that. JH: What kind of hobbies and things were you into when you were a kid? KL: I ran the gamut of hobbies and interests as a child. I loved seeing live music. My first concert was Fleetwood Mac at the age of 10. In middle school and high school I was really into punk rock shows and thrashing around in the pits. I played the flute, joined ceramics club, accounting club (yes, they exist) and became a cheerleader, eventually becoming captain of the squad. I also joined theatre club and although I was a horrible performer they were always kind enough to give me a dancing role with very limited lines. JH: Can you remember the first piece of art you bought (or were given)? KL: The first piece of artwork that kickstarted my collection was a gorgeous, dark painting of a dog sitting in a blue and orange desert landscape. It was created by my high school ceramics teacher, Mark Gleason. My parents were kind enough to buy the painting for my high school graduation, I had been singularly focused on purchasing it for over a year. Mark is still a practising artist today, and he remains one of my favourite artists. JH: What about the most recent piece? KL: My most recent acquisition is a painting by my mate Marc Etherington. 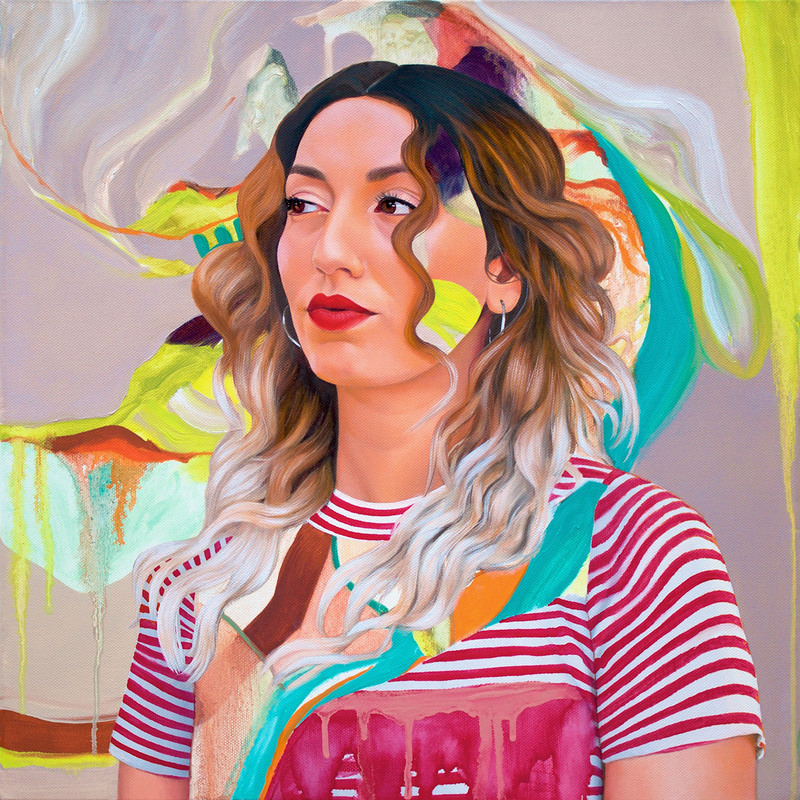 We’ve exhibited together twice in the Archibald Prize for portraiture which tours museums and galleries around Australia. Marc’s works almost exclusively take on pop culture, childhood memories and everyday domestic life as their subject matter, always depicted with a humorous lens. 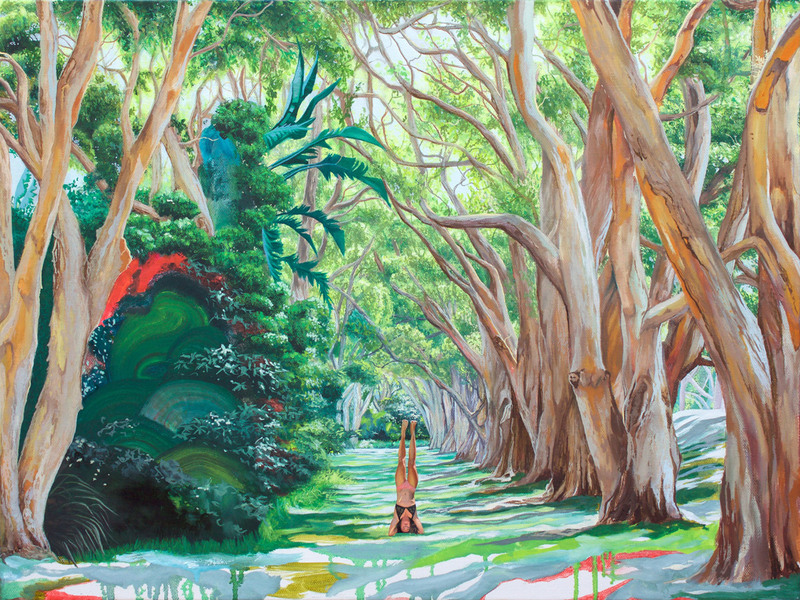 References to Jurassic Park, Freddy Krueger, old-school video game aesthetics and boom-boxes are not uncommon in his works, and his landscapes and interiors are depicted with an amusing amount of detail. My acquisition is a rendition of ‘The Labyrinth’ with me as Jennifer Connelly’s character. I traded him for a custom queer dinosaur portrait featuring my friend Liv with a plesiosaur head. JH: You’ve talked a lot about using your work to celebrate the LGBTQ community, and I get the sense you feel a duty to create, like you’re on a mission. 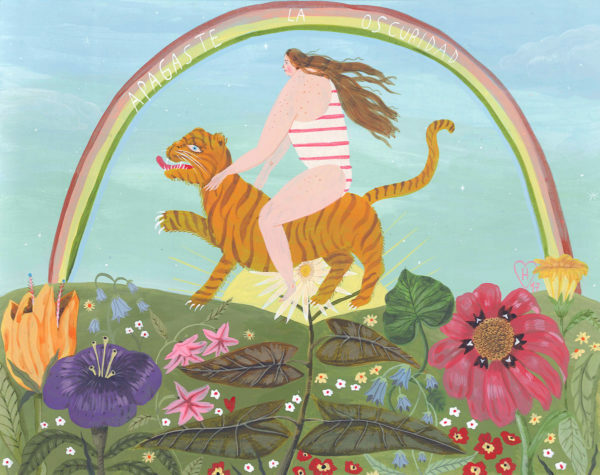 Was it always this way or has your approach to making art changed? KL: Ceramics, sculpture, printmaking and textiles have all moonlighted as my favourite medium since high school. I took up painting at 24, and although my initial paintings always featured women I did not have a clear vision or purpose. I was exploring my sexuality at the time. Since the age of 13 I’d always told those who enquired that I was ‘attracted to people, regardless of gender’. I now understand that the most accurate term is Pansexual. After several relationships with men I began meeting fabulous queer women and immersing myself in the lesbian community. As I moved around the United States and traveled the world I observed that Queer identities have varying aesthetics which metamorphose based on age, race, geography etc. I began to explore fluidly expanding identities in my global travels and depict certain aspects in my artwork. 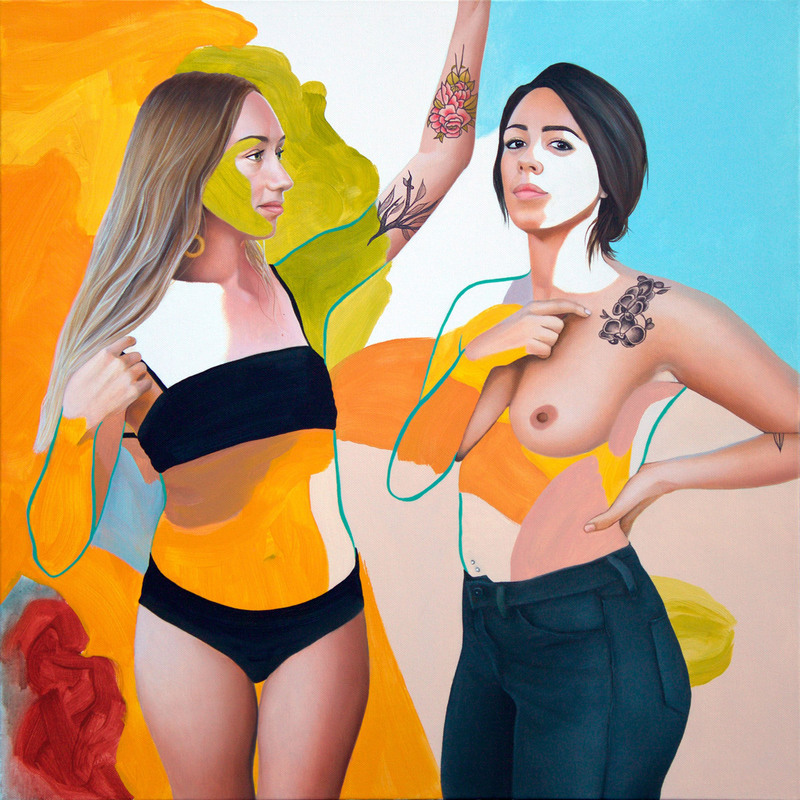 The bodies of LGBTQ-identified and Queer-allied women in my paintings were evolving with their social environment. 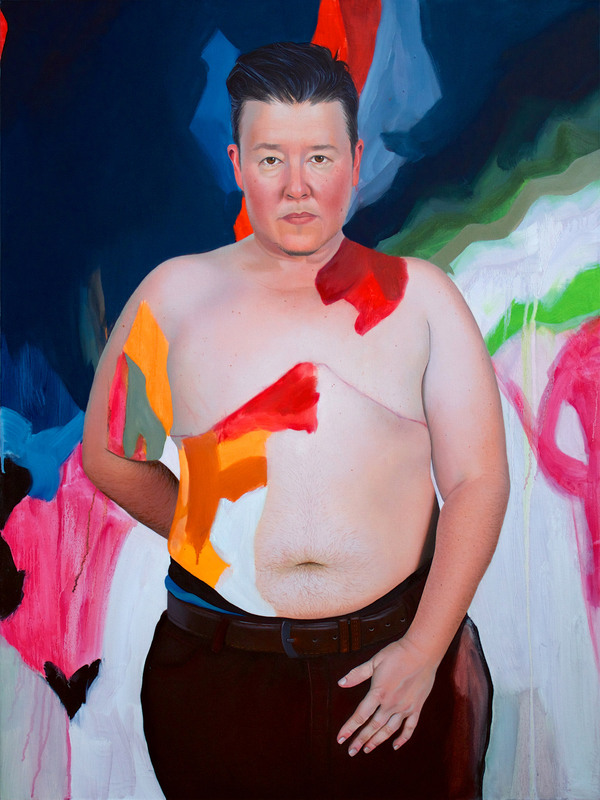 I depicted ways in which women modify their bodies, take on various permutations of androgyny, and are celebrated for it. The most recent work has evolved and become more intertwined with my personal life. Many of the portraits feature my partner, dearest friends, and queer activists…focusing on those who have impacted my life in some way. JH: Could you talk a little bit about the transparent areas that show up throughout your portraits, areas where the figure and the background merge? KL: I am constantly exploring the boundary between realism and abstraction to highlight the layers and complexity of identity and place. My love of incorporating strong colour and patterns started with studying the Pre-Raphaelites, and grew with studying Kehinde Wiley. I was fascinated with textiles and patterns employed by the Pre-Raphaelites to contemplate moral issues of justice, beauty, piety and the struggle against corruption. 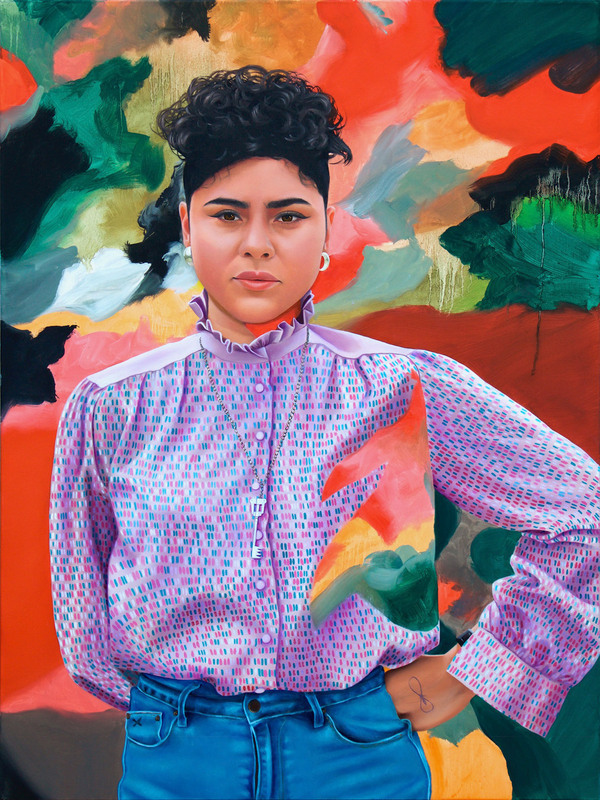 When I began painting women in front of their favorite patterns I was quickly introduced to the work of Kehinde Wiley, who is best known for his realistically rendered portraits of heroic figures depicted in front of decorative patterns of various cultures. Upon realizing there was another artist exploring similar juxtapositions I looked to history for further inspiration. I was drawn to the paintings of Tenebrists like Caravaggio who worked on black gesso, painting only where the light hits a person or object. I began to incorporate bright patterned backgrounds with tenebrism, blending abstraction and pattern where the subjects shadows should be. The colours and patterns reflect the taste and personality of my Sitter. JH: I know you’re a fan of British painters like Jenny Saville and Cecily Brown, who are some Australian artists inspiring you these days? KL: There’s a giant list of Australian artists who inspire me and we’ve built a great little community of support for one another both online and in person! Mark Etherington, Annalisa Ferraris, Natasha Bieniek, Tony Albert, Tamara Armstrong, Sophia Hewson, and Yvette Coppersmith, to name just a few of my favs. I’ve had the great pleasure of exhibiting with these artists at various museums and galleries in Australia, and have so much respect for their artwork. Ben Quilty is one of my favourite living artists. 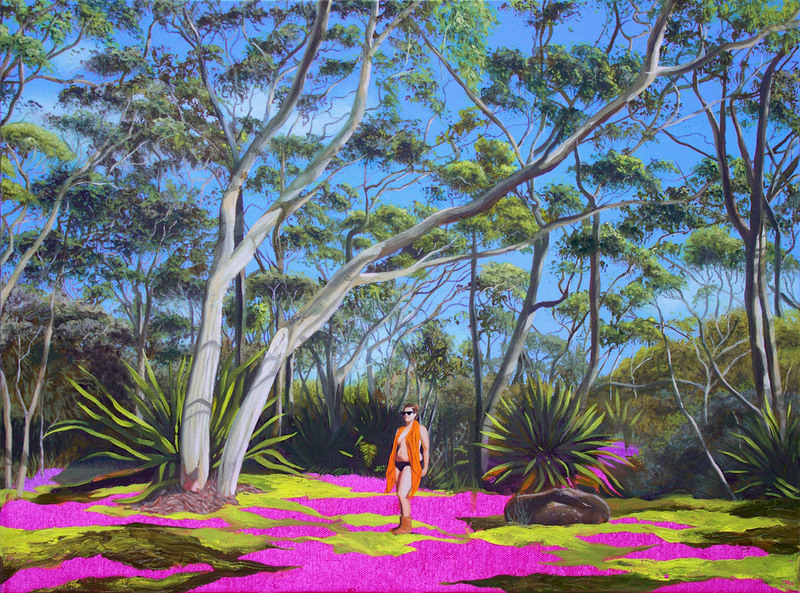 I first encountered his work in 2012 within days of arriving in Sydney after my move from Chicago. I saw his portrait of Margaret Olley which, unbeknownst to me, had won the Archibald Prize the year prior. 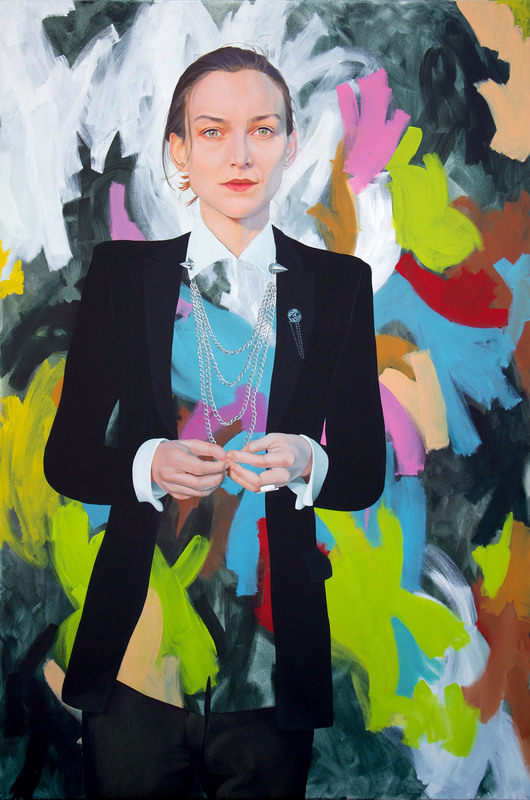 At the time I did not know who Ben or Margaret were, nor had I heard of the Archibald Prize… but the painting stopped me dead in my tracks. I had never seen anything like it. After spending about 30 minutes absorbing the work I took note of Ben’s name and made a point to learn more about his artistic practice. I first met Ben when I was selected as a finalist for the Archibald Prize, he was hosting a Q&A with my sitter and I for a large group of the museum’s benefactors. He has been a great supporter of my work ever since, and I am so grateful for his continued feedback and guidance. JH: What’s something you hope to accomplish this year? KL: It’s been a very long time since I’ve had the time and funding to host a solo exhibition of my work. 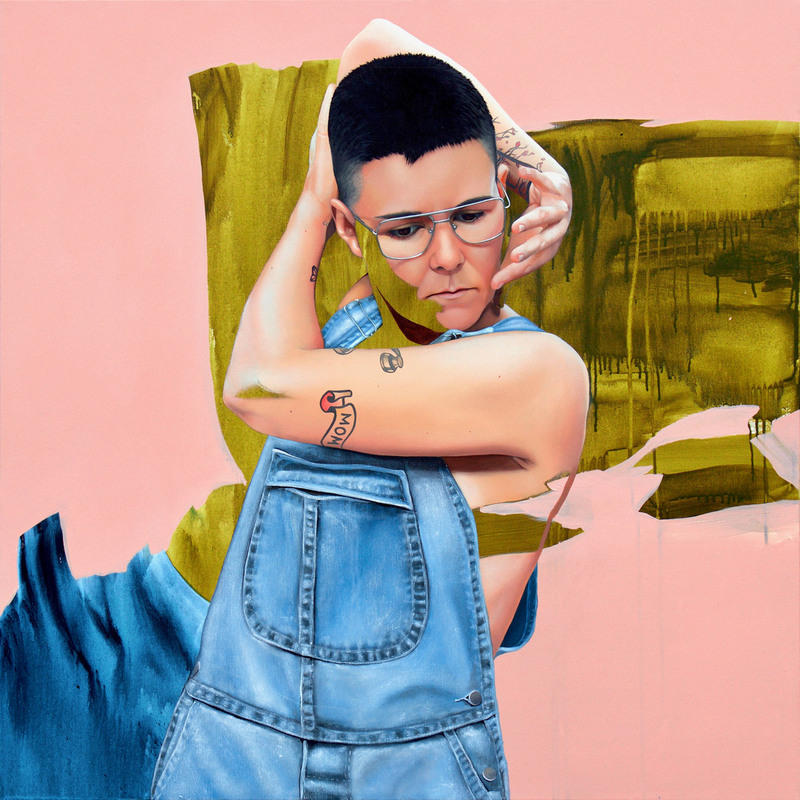 I am currently working on a series of oil paintings representing queer women from across Australia. I have a growing list confirmed ‘sitters’ who each engage with the politics of identity, community and activism in their own unique way. 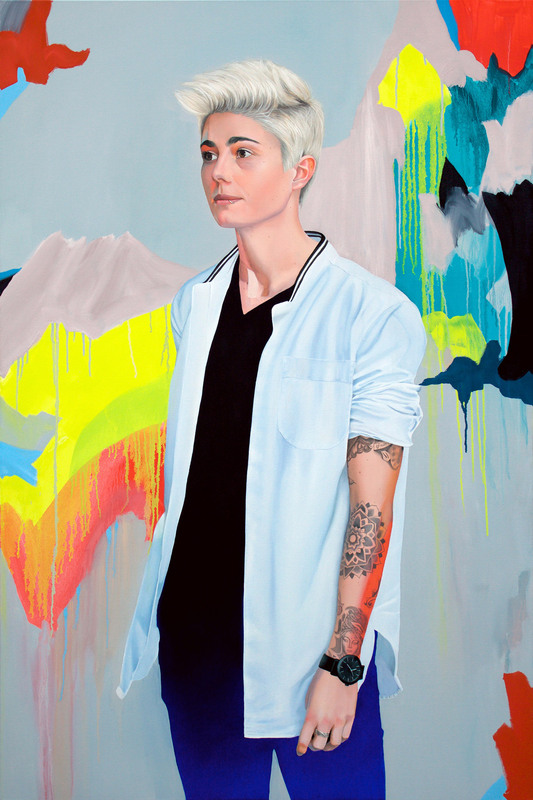 Some of my sitters include: Sally Rugg (Sydney-based activist advocating for LGBTQIA+ issues including marriage equality), Clover Moore (Lord Mayor of Sydney and LGBTQI+ Ally), Ollie Henderson (Activist, Fashion Designer and Model), Michelle Heyman (athlete who proudly represented Australia at the Rio Olympics in 2016), Briony Mackenzie (Founder and CEO, The Global Womens Project), and T. Chick McClure (fine arts photographer, Grammy award-winning director). 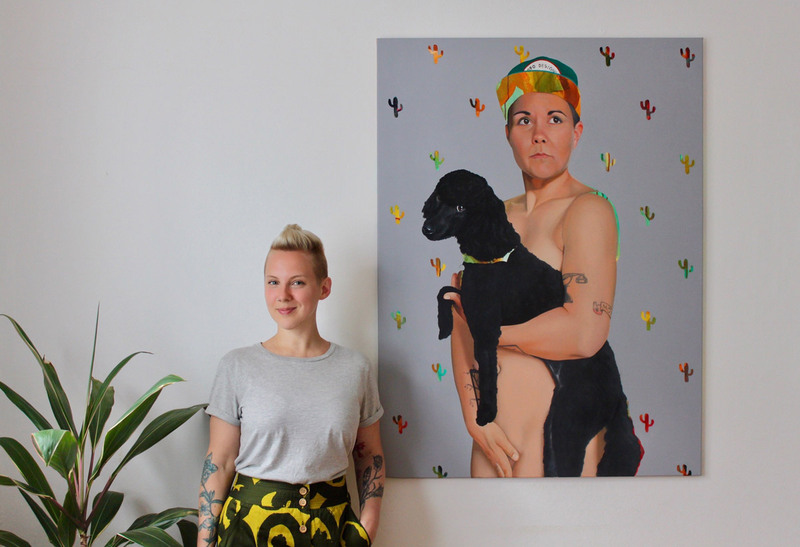 As part of the exhibition I’d like to teach a painting and drawing workshop and host a Q&A with several of the sitters, inviting the community to start a dialogue around queer feminist representation in activism and the arts. JH: And what about something you hope to accomplish in your lifetime?